In 2014, programming was introduced in schools for children as young as 5. Since then, teaching children to code has been a central theme for many new toys and games. Why? Children are growing up in a world controlled by software, it is crucial to give them the skills to understand and generate that software. The concept behind PiXLs is to allow children to observe, create and upload simple animations to their cool characters. Designing the PiXL range was a lot of fun. 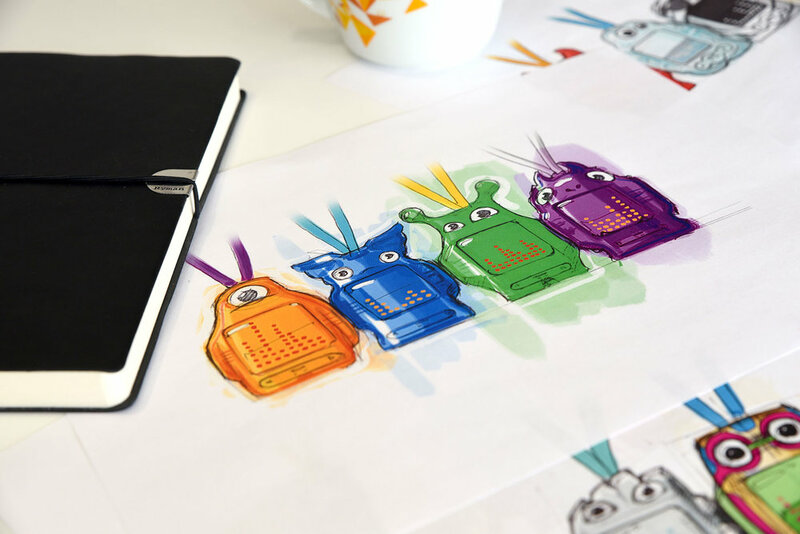 To create friendly, interesting characters with technological influences Designworks sketched a vast range of options. Working closely with the client, concept directions were developed into 3D virtual sculpts and engineered for mass manufacture. The dedicated app was developed in-house in tandem to reduce time to market. Animations are created on the PiXL app, and uploaded in an incredibly innovative, cable-free way. Simply hold the PiXL character against the screen and a series of flashes are read by a light sensor on the character’s back. These flashes transmit the unique animation to the toy! The user can then ‘bumpinate’ their toys to make them interact or swap animations.